Bloomington, Illinois (December 27, 2018)--As plans begin to take shape for the 2019 growing season, it is important to consider how various cropping rotations might affect a grower�s risk level for various soybean diseases and what options are available to help preserve yield. If continuous soybean production is the goal, key diseases to consider include Phytophthora root and stem rot, and soybean cyst nematode. Through careful variety selection and the use of additional tools like seed treatments, yield loss caused by these diseases can be minimized. Phytophthora root and stem rot is caused by the oomycete pathogen Phytophthora sojae. Early symptoms may include seed rot and pre- or postemergence damping off. Because these symptoms can be caused by a variety of pathogens, it is often necessary to submit samples of affected seedlings to a diagnostic clinic for reliable identification. In older plants, leaves that first display interveinal chlorosis may eventually wilt while remaining attached to the stem. Stunting and/or plant death results from a dark brown lesion that forms near the base of the stem and may extend upward several nodes. Continuous soybean production may increase disease severity because P. sojae can survive on crop residue. Resistant varieties have been developed to help growers manage Phytophthora and are important management tools. The existence of different races of this pathogen presents a challenge, though. These races differ in their ability to overcome the various resistant genes present in commercial varieties. Growers should make sure to visit with their seed providers to ensure that the resistant varieties they are using are effective for their situation. Seed treatments represent an additional tool that can be used to help manage Phytophthora. Not all fungicidal active ingredients are effective against oomycete pathogens, so it is important for growers to visit with their seed providers to ensure that an effective product is being used and that it is being applied at a rate that will result in satisfactory control. The soybean cyst nematode (SCN), Heterodera glycines, is the most damaging pathogen of soybean in the United States. Aboveground symptoms often occur in patches and may include stunting and/or chlorosis. However, in some cases, yield loss may be significant despite an apparent absence of noticeable aboveground symptoms. 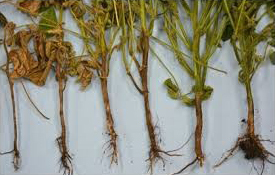 Belowground, infected roots may be stunted or discolored and have reduced nodulation. Depending on when root systems are examined, it may be possible to observe small, white, lemon-shaped females attached to the roots. These females are noticeably smaller than root nodules and eventually become cysts, each of which can contain hundreds of eggs. Because soybean cyst nematode can complete multiple generations per year, growing continuous soybeans can lead to a significant population increase. Soil sampling is highly recommended for growers to understand their individual risk for yield loss associated with this damaging pathogen. 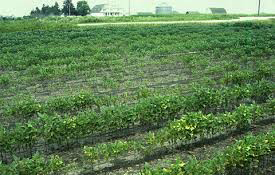 As with Phytophthora, commercial varieties with resistance to soybean cyst nematode are widely available. Unfortunately, most of these varieties rely on just a single source of resistance (PI88788). Although other sources of resistance do exist (Peking, for example), these sources are not as widely available. If necessary, a specialized test known as an HG type test can be performed by a diagnostic clinic to provide information about what source of resistance should be used in a field. In recent years, many nematicidal seed treatments have been developed, providing an additional tool that can be used to help manage soybean cyst nematode. Growers should recognize however, that the insecticidal active ingredient found in many soybean seed treatment packages will not protect against soybean cyst nematode. Visit with seed provider to determine what nematicidal options are available. I encourage all growers and crop advisors to visit www.thescncoalition.com for more information on soybean cyst nematode and its management.